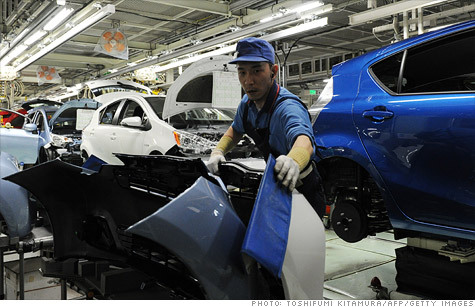 Japan's economic growth nearly doubles U.S.
Japan's GDP was nearly twice as strong as the U.S. in the first quarer, driven by domestic and government spending. NEW YORK (CNNMoney) -- Japan's gross domestic product grew at nearly double the U.S. rate for the first quarter, an unexpectedly strong sign of recovery in the wake of last year's devastating earthquake and tsunami. That's compared to the U.S., where the GDP rose at an annual rate of 2.2% in the first quarter. The Japanese GDP is a sharp contrast to a year earlier, when the quarterly rate fell 2% following the earthquake and subsequent tsunami on March 11, 2011. The disaster killed thousands of people, wiped out coastal communities and sparked the meltdown of a nuclear power plant. The annualized GDP of 4.1% was better than the expected rate of 3.5%, according to a research note from Deutsche Bank. This wasn't the first quarter of recovery since the disaster. GDP grew by 1.9% in the third quarter of 2011, but that flattened out in the final three months of the year.